It takes a certain type of obsessive personality to succeed in poker, a hunger to continually improve and learn as many of the game’s nuances as possible while staying on top of a constantly changing meta. That type of hunger, competitiveness, and obsession has always been present in David Williams, serving him well on his way to a successful poker career. And it’s all of those, especially hunger, that sent Williams on a temporary journey away from the felt and into the kitchen, where he’s now in thick of the hunt on popular reality cooking show MasterChef. Williams’ foray into cooking began a couple of years ago, when he started to make more meals and found it was something he enjoyed doing. He kept at it, using online tutorials as he strove to improve. His daughter was a fan of the show, and when auditions were held in Las Vegas for the seventh season, she convinced Williams to give it a go. Williams, who named French cuisine as his specialty,made the cut and is still in the hunt with the seventh episode of the season having just aired. The show was filmed in a sequestered location in the winter. Williams can’t reveal the outcome of course due to non-disclosure agreements participants in such shows have to sign, but he smiled and admitted he watches each week to see how things unfold. One thing it’s made him realize is that the life of a poker player might be swingy, frustrating, and at times very stressful, but overall, it’s a pretty good life. Williams has now focused a portion of his life on the art of cooking, and in order to make a mark on a show like MasterChef the way he is, one has to show considerable skills. Enough skills, no doubt, to be able to step into a restaurant kitchen and do the job as a profession. But, having seen for himself what it takes, it’s not something for which Williams is eager to walk away from his current work any time soon. He said he wouldn’t be opposed to owning a restaurant some day and even having a position as an executive or creative chef who planned dishes and set up menus. But as of now, cooking will simply remain a hobby. 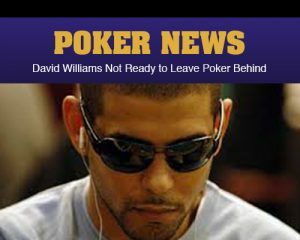 As such, Williams was right back where he belongs this week, sitting at a table in the World Series of Poker Main Event, the tournament where he first emerged as a force in live poker in 2004 with a runner-up finish to Greg Raymer. It’s been a strange summer for Williams, though, as he has played less at the WSOP than he has in the last 12 years. He estimated he’s only played seven or eight events as opposed to his usual 30, devoting more time to hanging out with his daughter and helping Phil Ivey with a new daily fantasy sports platform called Rosters. On the downside, Williams came into the Main Event a little bit cold, but saw a major upside as well. With the less time spent grinding, he viewed himself as fresher than he’s ever been coming into poker’s biggest tournament, one he amazingly hasn’t cashed since his auspicious debut. And with his elimination on the start of Day 3 after coming in dead last in chips, it’s a second cash in the WSOP Main Event that Williams will have to wait for. He got his final few chips in with ace-nine against ace-eight, but failed to survive.